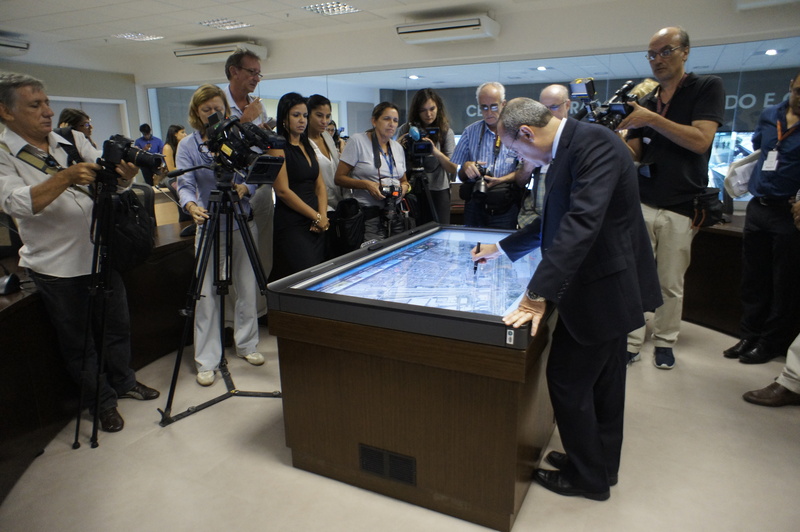 The foreign press visit this week to the Rio state public safety Integrated Command and Control Center (CICC is the Portuguese acronym) was one of what promises to be an increasing number of schizophrenic experiences, as time goes on. Brazil has long been described as “land of contrasts”, but until now this usually referred to contrasts between rich and poor, between the public and private sector, or between nature and manmade construction. As officials presented the CICC, with its helicopter pad, video wall, two crisis rooms, call centers, auditorium, four generators, 128 computer servers in a safe room and three mobile “elevated observation posts”, one couldn’t help but think of the O Dia newspaper story that ran a day earlier, describing decrepit work and living conditions for Military Police soldiers in Leblon, Rio’s cushiest neighborhood. 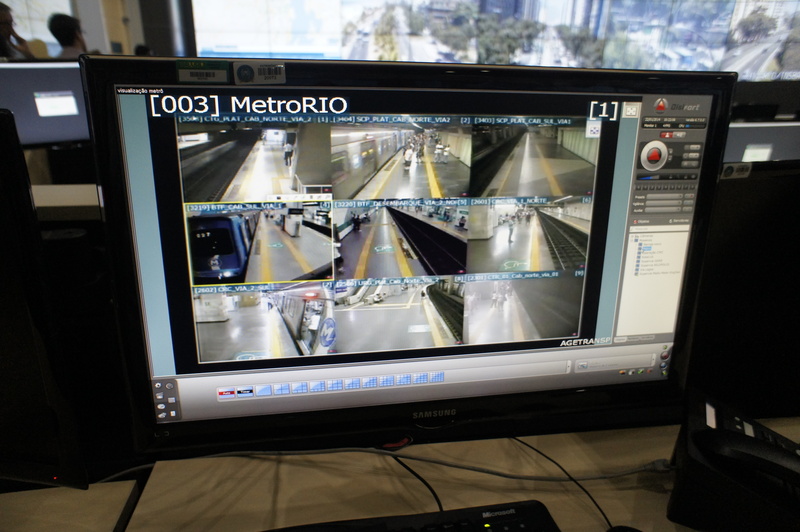 The same day as the CICC visit, an early morning train derailment caused a major snafu in Rio’s transportation grid, affecting a reported 600,000 commuters. Although this has nothing to do directly with the city’s public safety policies, it’s another worrisome aspect of daily life here, present in everyone’s minds. Yes, we have new dedicated bus lanes and the metro is being extended to Barra, but traffic is still horrendous and the average age of Rio’s trains, according to O Globo, is 36 years. The average age (how about a museum?). International Olympic Committee chief Thomas Bach, visiting Rio the day of the derailment, spoke about Rio’s transportation challenge in this interview. Strangely, few think to note that SuperVia, the concession running Rio’s trains, is sixty percent owned by Odebrecht Transport, an offshoot of Brazil’s top construction company, heavily involved in stadium work, among much else. Nor is it common knowledge that 30% of Odebrecht Transport itself is owned by the federal government, by way of its payroll deduction-funded FGTS fund. 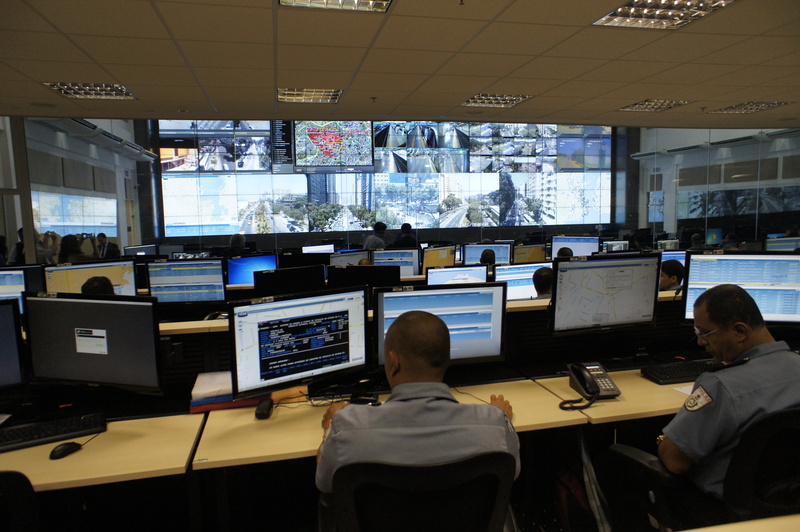 Despite the discrepancies within the public safety sector and between it and other public services, government officials point to Brazil’s bunch of megaevents as a watershed moment. Comparisons are difficult to come by, either over time, or between Brazilian states (Readers, help on this would be appreciated). 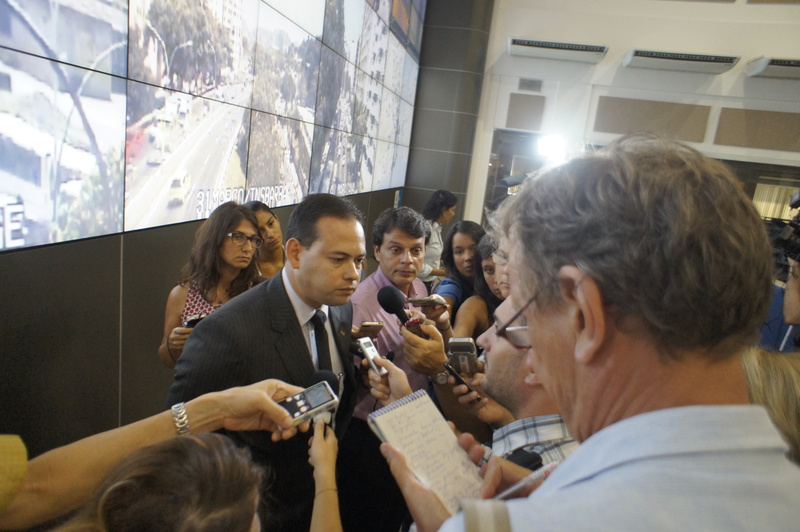 According to the state Public Safety Secretariat, Rio police spending in 2007, before Governor Sérgio Cabral took office, was US$ equivalent 974 million, with a total police force of 48,000, and in 2012 this rose to US$ equivalent 2.2 billion. By the end of last year, the state police force totaled 54,000 men and women. 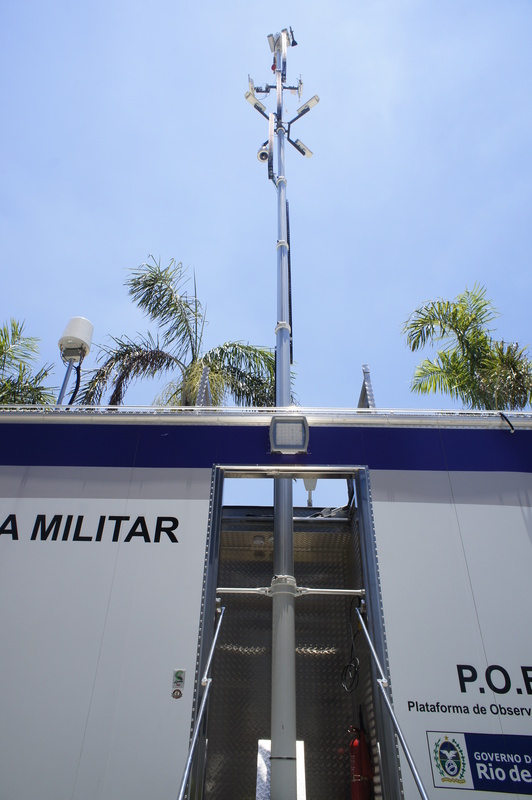 No official present would go so far as to say that the Rio police are at the forefront of public safety modernization in Brazil, but they did note that, when it comes to mega-events, the forces here have more experience than those in other cities. 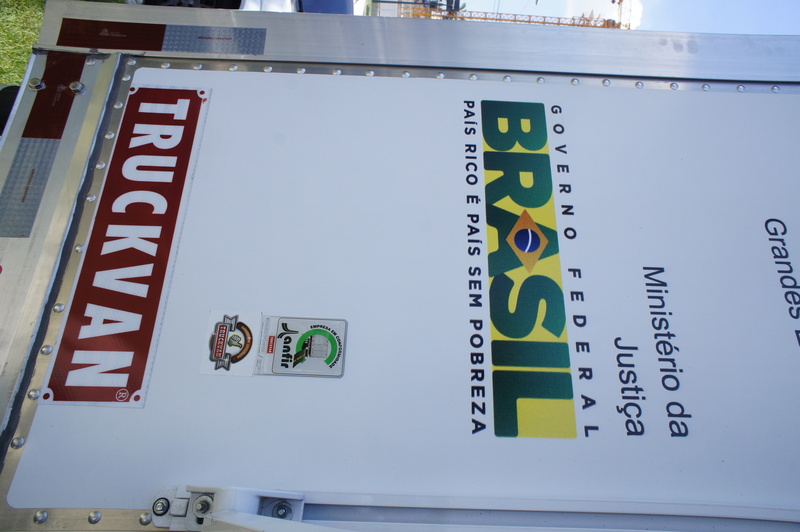 And money is pouring in, with almost US$ 300 million equivalent earmarked in Banco do Brasil financing for a new state radio communication system, three helicopters, and 45,000 bullet-proof vests, among other items. 36 large Military Police projects, including the Special Operations Center (COE, according to the Portuguese acronym), which will house the BOPE, or elite squad; a new logo, new more efficient police vehicles; a new tourist police headquarters; new palmtops and air patrol equipment; and a new central police hospital. A US$ equivalent 25 million-“Police City” for Rio’s state Civil Police (responsible for investigatory work, while the Military Police are in the streets); modernization of the Civil Police Academy, new homicide divisions in Rio and some neighboring cities, new facilities for the forensic department, and modernization of the intelligence unit. The police pacification program, which directly affects about 500,000 favela residents, and including their neighbors, 1.5 million, according to the state public safety secretariat. New performance-oriented police pay bonuses, tied to local crime statistics. 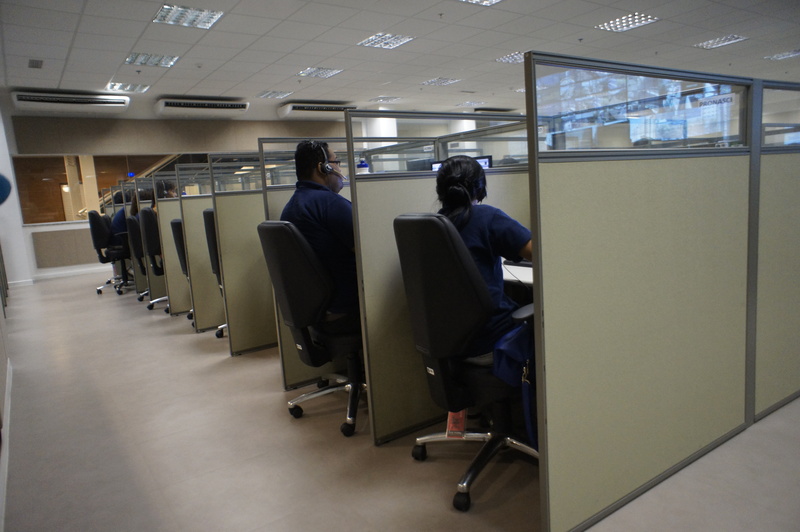 New overtime pay capability for police officers, who used to work during special events and then take off time to compensate. US$ 40 million equivalent spent for a Military Police private network, two anti-riot water cannon vehicles, two sound and image transmission systems, a water truck, forty dogs and a veterinary ambulance. 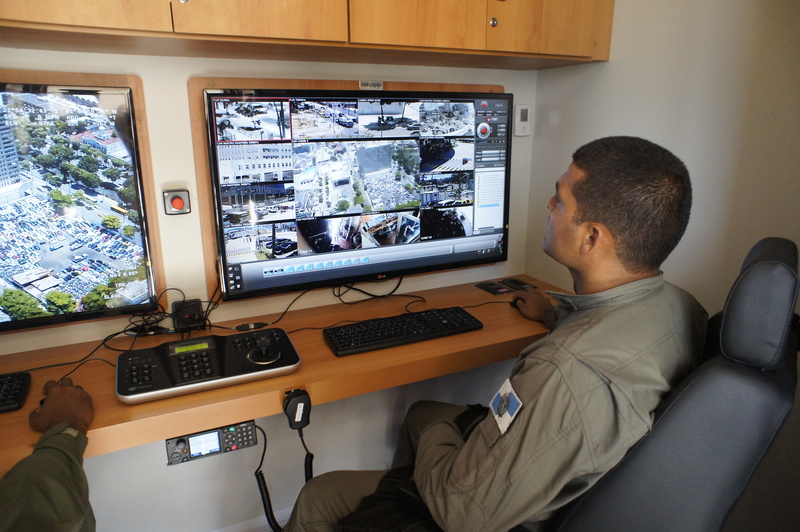 US$ 31 million equivalent spent for Civil Police solutions system, investments in forensic police, less lethal weapons for tourist and kidnapping police units, an aircraft, self-service posts, investigative work, vehicles, training. With all this investment, will the Rio police need help from the Brazilian military? That depends on the challenges they face during the Cup, officials said. The Army has participated in public safety activity in the past, including the 1992 United Nations environmental conference, ECO 92, and in November 2010, when the Complexo do Alemão was occupied in order to stop vehicle torchings around the city. In December, the Defense Ministry published a new regulation changing the constitutional definition of national military forces, so they can easily be called upon if needed — including in the case of urban disturbances. Federal and Rio state officials have obviously been planning for such an eventuality. Asked by foreign reporters what the biggest threat might be to the Cup, one official would only say that terrorism isn’t at the top of his list. Another official repeated the word cinturão, or big belt, a tactic police used successfully during the 2013 Confederations Cup, to keep protesters far from soccer games. How likely are the protesters to make a reappearance this June? The contrasts — a sort of mixed message — are key. 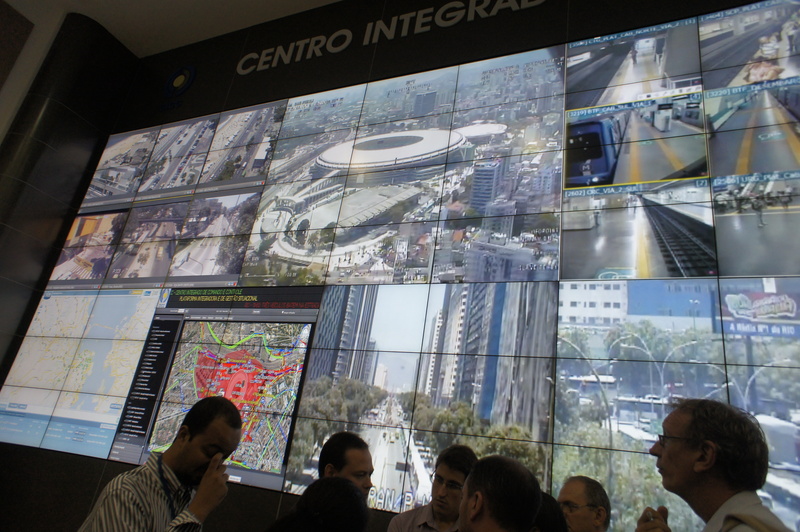 The state of Rio may well have accomplished an enormous amount of police modernization. But credit is hard to fully award when you can’t stop yourself from looking sideways: what about those Leblon barracks, and what about the antique trains, and the filthy bay? And what about angry citizens, such as a neighbor who came across a grocer who’d been shot early one morning in Cascadura last weekend, and called one of the 190 attendants in the fancy new CICC? Half an hour later a police car arrived, and an officer told a group of neighbors assembled around what was now a body (the man’s hand was moving, earlier on) that the police don’t do first aid. Also, that the cops hadn’t heard about the shooting over the radio (it didn’t work), but someone in the street had directed them to the crime scene. Forty-six minutes later, an ambulance drove up. One of the government officials presenting the CICC, on hearing the story, explained that 190 is for police emergencies (crimes), 192 is to call a city ambulance for lesser health emergencies, and 193 is for the firemen, who, in addition to putting out fires, also save people’s lives. Here you can see how different countries organize their emergency numbers. When Rio first began to turn around, in 2008, Brazilians often used the expression enxugar gelo, or drying up ice. They wondered if the new policies would ever be able to address the enormous problems facing the city. Much has changed since 2008; now one doesn’t hear this expression so much any more. But people do comment on just how far down “the hole” is. They look at an achievement and say “o buraco é mais em baixo”. The hole in question, according to this blog’s research, might be in the cemetery, at the bottom of a well, or anatomical. In any case, its location, lower than what you might have thought, points to continued complaint and protests. Yet, of all the twelve World Cup cities, Rio may turn out to be the best-equipped to handle them. This entry was posted in Brazil, Transformation of Rio de Janeiro / Transformação do Rio de Janeiro and tagged CICC, Rio de Janeiro police reform, Rio de Janeiro public safety spending, World Cup 2014, World Cup Rio de Janeiro. Bookmark the permalink. 9 Responses to Is Rio ready for the World Cup? Rio de Janeiro state has been spending loads of money on security but strangely thefts and violence in general have been increasing. I do not feel safe in the streets of Rio. In my opinion the whole country is not ready to deal with a such mega event. There will be more tourists visiting the cities and I am not sure that the states will provide security for them. The lack of infrastructure is there for everyone to see. Of course it will be a little disorganised, Brazil, alas, is a ‘developing country’, not a fully developed one, so, it is rather naive and unrealistic to expect services and infracstructure of a 1st world country. But, it will more than make up for its flaws, by the exuberance of its people and locations. There’s bound to be protests, of course, it is a Presidential election year, and forces will undoubtly pushing for disruptions. But, we must remember, that even at the peak of 2013 June protests, when we had about 1million in the streets, is that: 1- all services carrry on regardless, 2- about 201 million of people were NOT in the streets, but watching it bemusedly on TV. So, yes, expect a few bumps along the 2014 road to Brazil, but I have no doubt, it’s all gonna be rather spectacular. Is the World Cup ready for Rio? The presidente of brazil, has promissed: “The World Cup of all World Cups” I am not sure about it and we will have serious problems that will not be solved in time. The World Cup is a mega event and should take place in developed countries because they have more infrastructure than less-developed countries like brazil. The WC is indeed a mega-world-wide event. Although I do understand your reservations about such events NOT being held at, as you say ‘less developed countries’, I would argue that this is a rather elitist approach, and we might end up with the greatest sports and cultural happenings, only taking place in Germany or Sweden. We definitely don;t want that. I would argue that it is precisely because countries like Brazil or South Africa, that still lack some infrastructure, that the Olympics or the WC are great opportunities. Leaving all the politics aside, and as you know, much of the protests in BR are politically-driven, if you manage to by-pass most of the scaremongering media, you will find that there’s an array of decent, good programs and works taking place in Brazil, directly as a result of the World Cup, that ranges from sports and community projects, to even free English lessons to the Metro workforce of São Paulo. I’m in no doubt that the World Cup 2014 will leave more than a few US$ leftovers for all Brazilians. and let’s not forget, and will bring joy to billions world-wide too. Actually GringaBraziliensis, just this past year Munich’s population elected to not hold the Olympics, so I don’t know where you are getting the idea that the greatest sports will only happen in Germany and Sweden. Most countries have figured out that they spend much more in the costs than they receive in the benefits and that is why they choose not to do it. Again, I don’t know where you are pulling your ideas from, but having read several articles in the Economist about this so I would love to see some numbers to back up your thoughts. Finally, most protests in Brazil are not politically driven at all. In fact, most young people hate political parties and are just expressing their frustration at a government that is not accountable, does not invest in its youth, is corrupt and inefficient. I agree with You. You are right about the benefits that the World Cup brings to the host countries and that there must be a rotation system so that all nations can benefit from it. Thanks. thanks for all the comments dear readers, it’s lovely to see this exchange! !